You probably never thought you’d see Miley Cyrus and Tim Tebow in the same sentence. But last week, both of them were in the news. For different reasons. Tim Tebow was cut from the New England Patriots. It’s not the first time this has happened. He’s had so many ups and downs in his career it’s hard to keep track of him. The fans seem to cheer and boo on cue, as he is celebrated and ostracized- often in the same week. But I have a feeling Tim Tebow doesn’t really care. Because he serves an audience of One. That stays the same however big or small his fan base gets. And then there’s Miley Cyrus. Can any more really be said about her? All I know is I felt nauseous watching her advertise her puberty in a loosely choreographed burlesque show that appears, by all accounts, to have backfired. Her comment to an interviewer one week after the VMA’s? But I have a better idea. 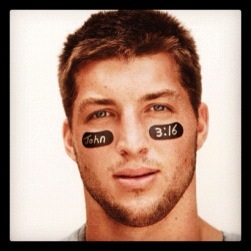 Let’s let Tim Tebow do it. He’s got some time on his hands since Friday. And he might not be a youth pastor, but he sure has been a role model to a lot of youth. So let’s imagine he says yes. And Miley agrees. And we get to listen in. Tim: Miley, you burned up the Internet last week. At one point you were up to 300,000 Twitter mentions per minute. Miley: Yeah. If you want, I could give you some tips. Got any stuffed teddy bears? Tim: Believe it or not, one time in 2009 I had 90 million hits. Miley: No way, what did you do? Tim: Wrote John 3:16 in black under my eyes. Miley: “For God so loved the world that He gave his only son.” Wow, that’s beautiful. Maybe I should tattoo it under my devil horn hairstyle? Tim: It might be a good way to showcase the extent of the verse. Miley: So Tim, what are you going to do now? With no team, no cheers, No fans? Those are the things I live for. Tim: Miley, I’m going to do the same thing I’ve always done. Use my platform, however big or small, to point to my audience of one. 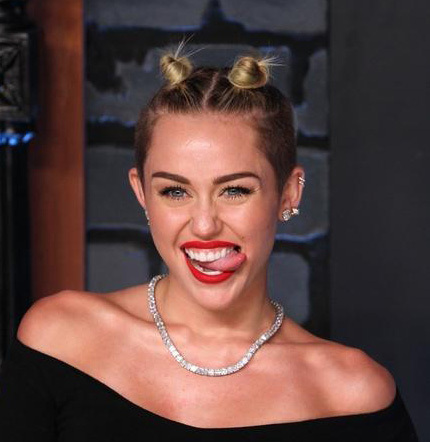 Miley: Only one in your audience? Tim: Not always. He’s just the one I play for. Tim: You keep that. I am praying next time you’ll use it to point to something other than you did. Miley: Tim, everyone knows there IS nothing else. Especially if you want to be famous. Miley: Sounds like my publicist. Tim: You know Miley, you can always start a new story. That’s what John 3:16 is all about. If the VMA awards are an indication of the one you’re writing, it might be time to invite the Editor to change it. He’s got more in mind for you than the voices you are listening to right now. Miley: So how do I get a hold of you if I want to talk about this more? Miley: But there is nothing on it except your number. No job. No team. Just 2 Corinthians 12:9. What’s that? Tim: Those are my credentials. Guess you’ll have to google it to find out. “I would like to thank Mr. Kraft, Coach Belichick, Coach McDaniels and the entire Patriots organization for giving me the opportunity to be a part of such a classy organization. I pray for nothing but the best for you all. I will remain in relentless pursuit of continuing my lifelong dream of being an NFL quarterback. Would that we all had the grace to win and lose like Tim Tebow. And I’m guessing at this point, what Miley Cyrus needs most from us is our prayers. What would you add (if anything) to the dialogue between Tim and Miley? Very clever creative and insightful- well played! What a great look at two figures out in front of us. Just awesome! This was very imaginative. I realize that my response comes a bit late, but better late than never. I hope you’re continuing to expound on the gift you’ve been granted to inspire. thank you! And I couldn’t help but notice your name was Tim… you wouldn’t be?? ?